This system is characterised by active suspension control, that automatically and continually adjusts damping to maintain a steady attitude regardless of road conditions, reduce the amount of vibration transferred to rider and passenger, and significantly improves riding comfort and stability. The name ""Skyhook"" describes the feel of the bike, which seems to be hooked up to the sky and immune to bumpy terrain. The new suspension is motorcycling's first semi-active system, along with the BMW HP4's. It works by continuously altering the damping front and rear according to a wide range of parameters, but the most important is its response to the speed of movement of the suspension. This is measured by two sensors at each end of the bike. One is positioned on the unsprung mass so it moves up and down with the wheel. The other is above it, attached to the sprung mass - the main body of the bike. The constantly changing distance between these is integrated mathematically to determine the speed, and using this, the Skyhook ECU adjusts the damping to predetermined settings. 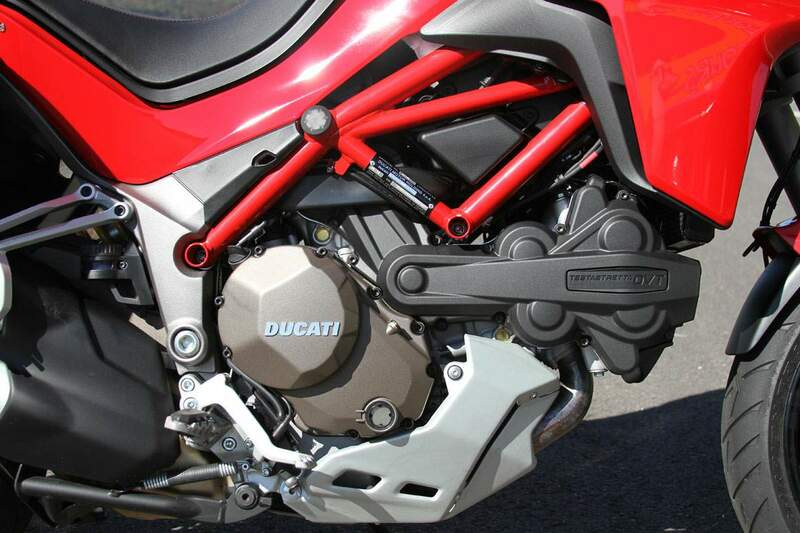 Because the damping is entirely electronically controlled it's possible to have a much wider range of damping settings than with a conventional system, or indeed Ducati's previous passive electronically adjustable system, DES. The graph shows just how wide the spread of available damping is, allowing the bike to cope much better with suspension extremes. 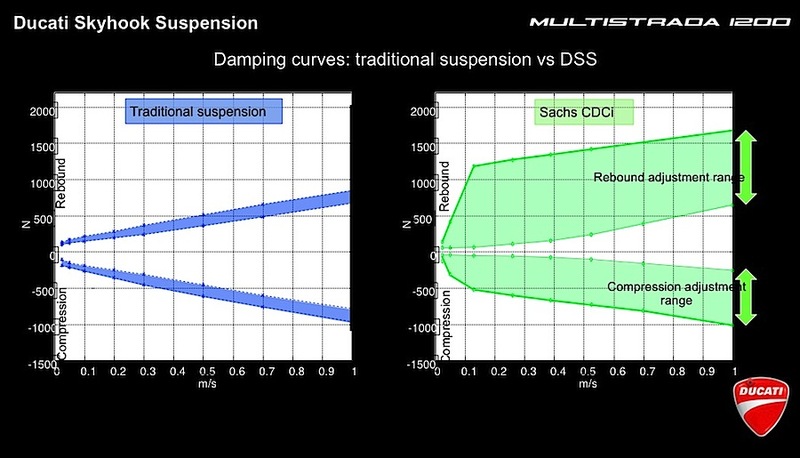 Yet the system works extremely fast, capable of switching from maximum to minimum damping in just 10 milliseconds. This means if you're riding gently on a smooth road in a soft setting such as Urban and the fork damping is close to its minimum, then you find you're having to slam on the brakes to avoid a dog running out, the front damping will have switched to maximum compression damping well before the forks have reached the end of their travel. The damping valves themselves are nothing like the conventional stacks of shims or tapered screws in conical holes you have in standard suspension. Instead, they're more like a slightly loose fitting piston in a cylinder bore which the oil flows around. The piston is part of the electric solenoid so its position can be changed very quickly by an altered electrical signal, altering the speed with which the oil can flow past it. There are other parameters taken into account as well as the suspension movement speed, including the throttle position and speed of operation, the brake line pressures and whether or not the ABS has been activated, road speed and acceleration, so the suspension will adjust automatically when you're accelerating and according to how hard, as you apply the brakes and so on. In the different riding modes the Skyhook system still has access to and makes use of the full range of damping settings, but switching from one mode to another changes its zero point. 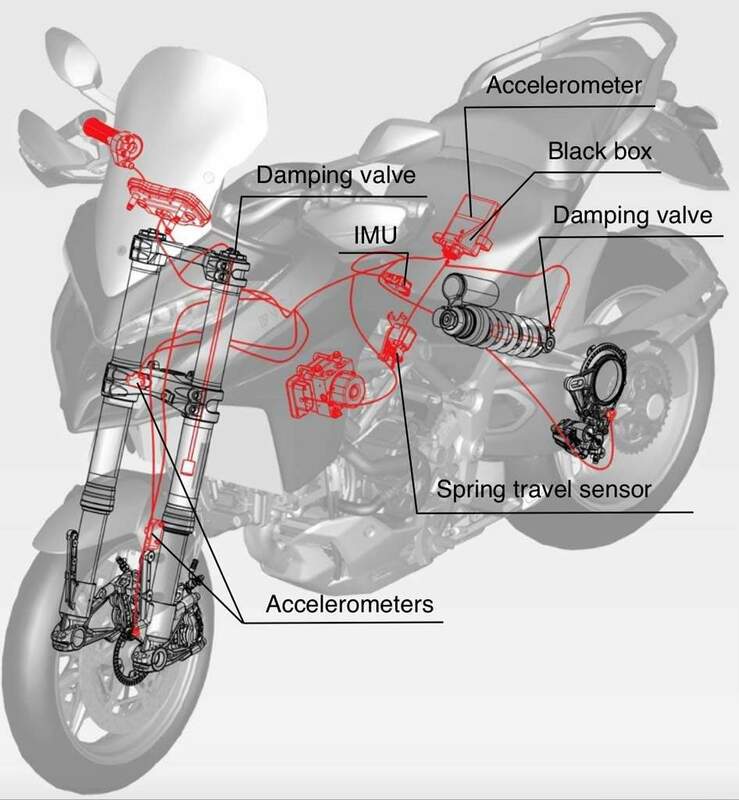 In Sport for example its zeroed towards firmer damping settings and it always returns to those in normal riding, while in Urban or Enduro it sits at the other end of the scale, providing a softer ride in normal conditions. What the rider sees in the dash is shown in the Instrumentation image. The menu is navigated in the same way as before via the indicator cancel and two additional sliding buttons on the left switchgear. There's an increase in the information displayed in each mode, with horsepower, throttle response, DTC and ABS information, and for personalising the suspension the display is different. 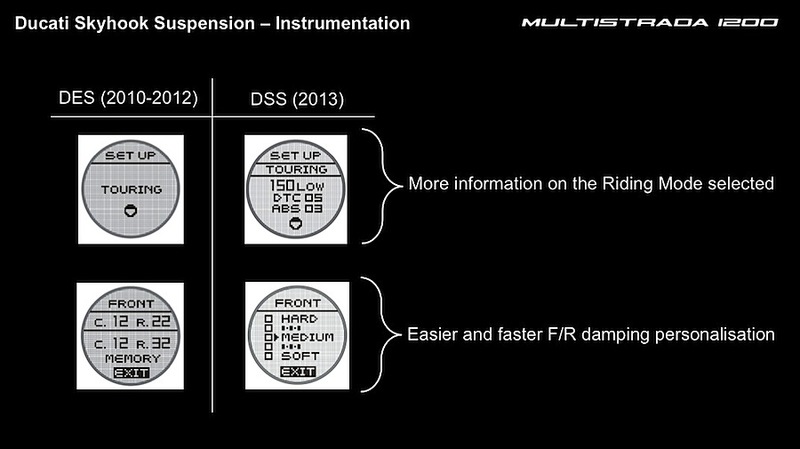 Where the old showed the separate compression and rebound settings as 'click' numbers, on the 2013 S models, you can increase or decrease the damping harder or softer by two stages from the central medium default. This can be done in each of the four modes, so for example if Touring is too firm, you can change it to one or two softer settings, and it will stay there unless you change it back.